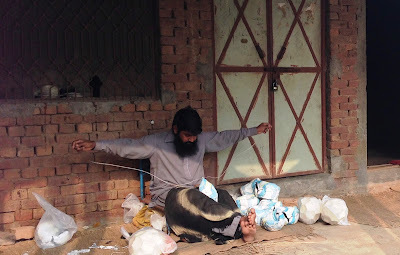 Collective Blog: Is the Minimum Wage a ‘Living Wage’ in Pakistan? Is the Minimum Wage a ‘Living Wage’ in Pakistan? In June 2016, while announcing their budgets for the 2016-17 fiscal year, the federal government and all the provincial governments increased the monthly minimum wage for unskilled workers from Rs.13,000 to Rs.14,000. Similar increases in the minimum wage have been made in previous years as well, and as far as we know, no criteria on needs or cost of living are used to determine the minimum wage. Given that these increases are arbitrary, the question arises: is the minimum wage even sufficient for a worker and his/her family to live a basic but decent life? In December 2015, using a methodology developed by Richard and Martha Anker, we set out to determine what a living wage is for rural and urban Sialkot, Punjab. Specifically, we were interested in workers involved in the football manufacturing value chain. We defined a living wage as the remuneration received for a standard workweek by a worker in a particular place sufficient to afford a decent standard of living for the worker and her or his family. Elements of a decent standard of living include food, housing, non-food non-housing expenditures (such as education, healthcare, transport etc.) and a provision for unexpected events. All of these elements were estimated using a combination of primary and secondary data. To estimate food expenses, we used data from the Household Integrated Economic Survey 2011-12 to formulate a model diet, which was then adapted to local preferences based on interviews with workers in Sialkot. Using price data from local market surveys, we then estimated the cost of this model diet. Table 1 shows some key features of our model diet, which also ensures that international standards of proportions of macronutrients are met. The standards specified are that proteins, fats and carbohydrates constitute greater than 10%, between 15 and 30%, and less than 75% respectively of the diet. For housing, we first set a minimum housing standard based on secondary data and international standards. The housing component of the living wage was then estimated through housing market surveys in Sialkot for our standard house in areas that workers reside in. The third important element of the living wage, non-food non-housing expenditure, was estimated using secondary data and then adjusted based on primary data we collected on household expenses. This category includes education, health care, transport, clothing, recreation and other essential needs. Finally, we included a small amount on top of all these expenditures for unforeseen events and shocks, such as health emergencies. Is the minimum wage enough? Using this detailed methodology, for urban Sialkot we estimated the monthly living wage to be Rs.20,344, which is 56% higher than the minimum wage in December 2015. In rural Sialkot the difference is less, but still quite stark; our estimated living wage is Rs.17,559 per month, which is 35% higher than the minimum wage for our reference period. Clearly, the minimum wage in Pakistan is not sufficient for a worker and his/her family to lead a basic but decent life. In fact, the difference between the living wage and minimum wage is extremely high, which perpetuates, among other things, poor living conditions, malnutrition and illiteracy. Therefore, to reduce the wage gap, first and foremost the onus is on the state to reevaluate how the minimum wage is determined – it should be regionally and occupationally disaggregated – and to implement labour laws more robustly. Ideally, the minimum wage should equal the living wage so as to improve the livelihoods of workers and increase opportunities for social mobility.